ImageBlocks makes it easy for you to convert from PNG, BMP, JPG, ICO (Windows only), XPM, TIFF, format files to PNG, BMP, JPG, XPM, or TIFF files. 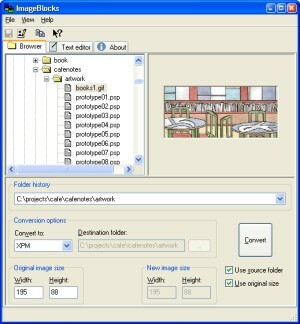 Use the file browser to select the file you wish to convert. You can conveniently navigate between folders using Folder history, which stores the last 20 folders. Select the destination file type in the Convert to control. If you wish, select a different Destination folder by first unchecking Use source folder and then clicking on ... to browse for a folder. You can specify the final image size if you uncheck Use original size. This is particularly useful for ICO (Windows icon) files, so you can specify for example 32x32 or 16x16, and the appropriate image will be extracted. Click on Convert to convert the new file. If the destination file is in the same folder as the source, the destination file will now be selected in the browser. 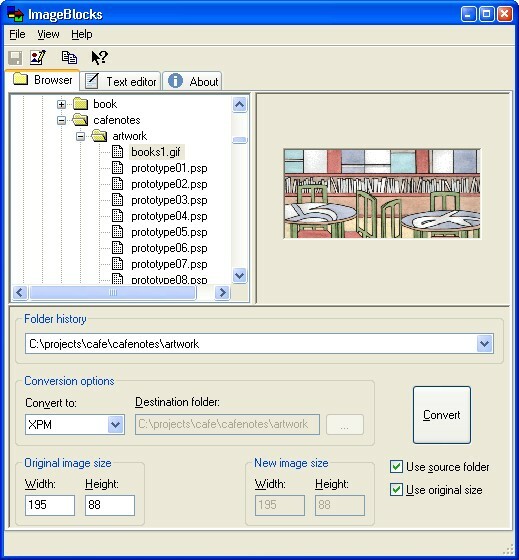 You can edit a selected image in an associated editor by clicking on the tool or File|Edit Image menu item. The application that is started depends on what is currently associated with that image type. You can edit XPM files as text by clicking on the Text editor tab when an XPM file is selected. XPMs have a simple form using C++ syntax, and you may wish to refine the file directly, for example substituting None for a hex colour in order to make that colour transparent. Click on the tool or File|Save menu item to save any edits. You may need to select another image, then select the original image to see any changes in the image view. You can copy the selected image to the clipboard using the tool. You can then paste the image into an image editor, for example. Note that the depth will be the current screen depth.